She was supposed to be cooling off. Instead, things are heating up, and now no one is safe. Ellen Galway has been living life on overdrive. It’s not just her job as a newly minted prosecutor. Her relationship with Texas Ranger Luke Jackson is also getting overheated. Luke keeps knocking down all her boundaries. Ellen’s whirlwind trip to Saratoga Springs to hear her twin sister Maggie’s presentation offers the perfect chance for a cooling off period. Then Luke turns up in Ellen’s hotel lobby. His instincts tell him Ellen and Maggie could be in trouble, and he’s determined not to let anything happen to them. When Maggie disappears, Ellen joins Luke in search of a remote cabin in the Adirondacks. They must find a way to work together if they want to find her sister alive. Includes two bonus short stories! Gus Winter takes on a killer in the White Mountains in “On the Run,” a sequel short story to the Cold Ridge series. In “Cold Moonlight,” a sequel to the Black Falls series, former Navy SEAL Ryan “Grit” Taylor is out to save the daughter of the US vice president. 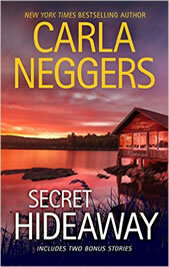 Note: “Secret Hideaway,” a sequel to the Carriage House series, is not available in print at this time.”On the Run” is available in print in THRILLER 2, an anthology edited by Clive Cussler, and “Cold Moonlight” is available in print in LOVE IS MURDER, an anthology edited by Sandra Brown.